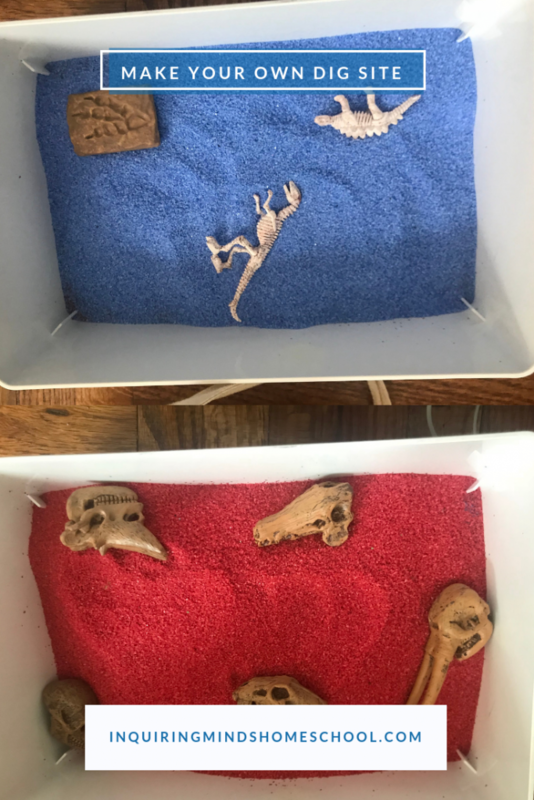 A few months ago, my son and I studied prehistory (more on that here) and quickly found our favorite activity: simulated fossil digs! These can be simple, easy to set up experiences that get kids excited about learning and thinking like actual paleontologists. This is Part 1 of 2, in which we’ll cover selecting materials for your dig site and setting it up. In Part 2, we’ll get into the actual dig experience for your kids! 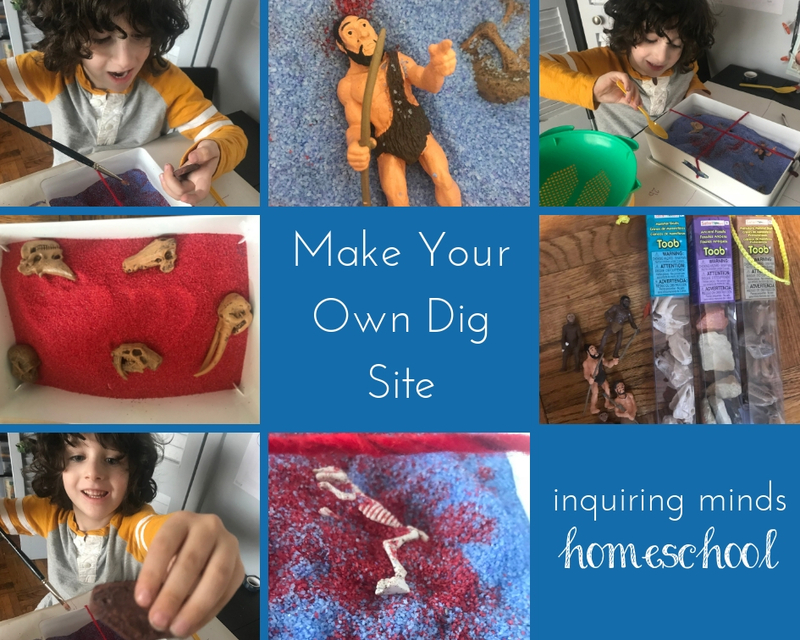 Make your own dig site for a homeschool prehistory paleontology study! Why are simulated digs so helpful? Simply put, doing your own simulated dig puts your child or children in the position of BEING the scientist. They are going through the same steps and thought processes with the model site, making discoveries along the way. It’s a great opportunity to develop patience, attention to detail, and problem solving skills while solving a mystery – what story does this dig tell? You can create simulated digs for any time period – from the earliest prehistory to human civilizations. 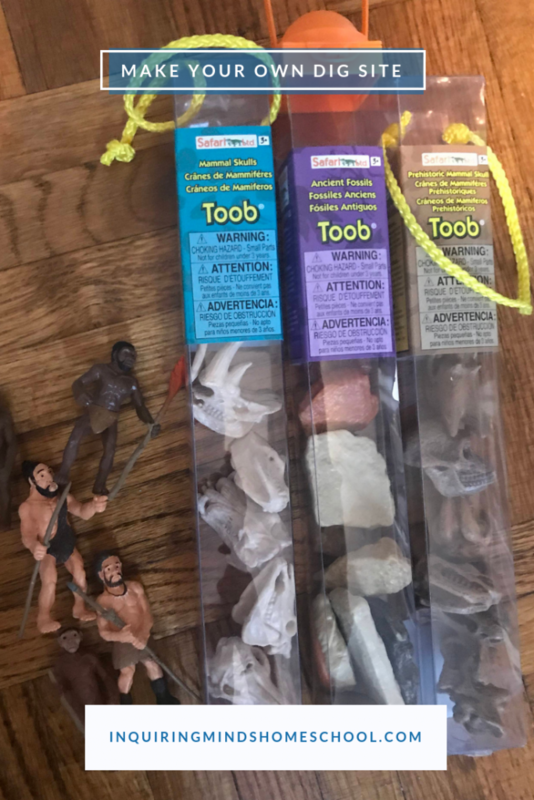 If you’re using fossil replicas, then your kids are doing paleontology – but if you’re concentrating on humans in the past, like giving your kids a model Pompeii to excavate, then it’s archaeology. Note: Recommended products in this post are affiliate links, meaning that I earn a small amount of commission if you purchase one, at no cost to you. 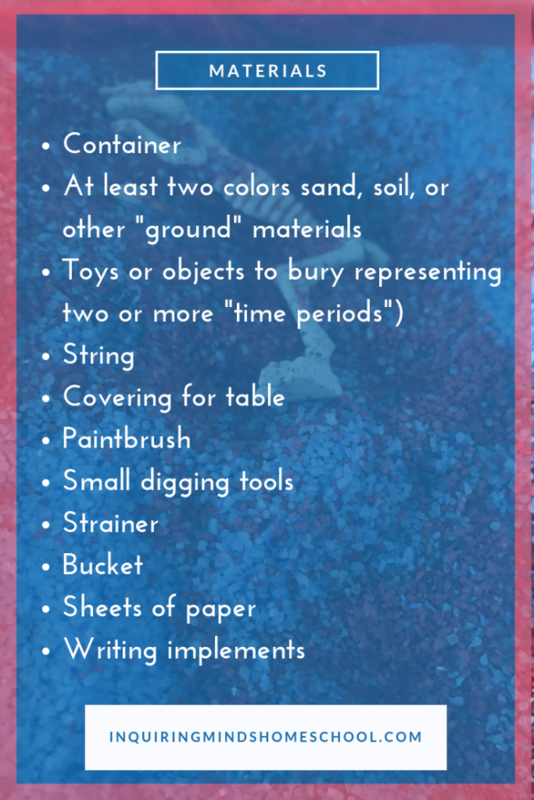 I’ve created a list of the main materials that are needed to make a model dig site. The actual items to bury in the dig will depend on the particular time period and focus that you’re going for. 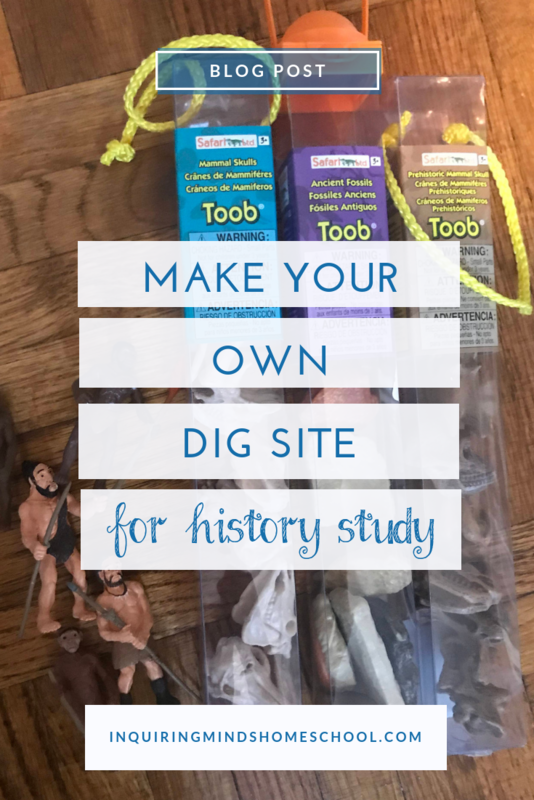 The example dig in the photos includes ancient fossils, dinosaur fossils, and early hominids, but you could easily substitute anything relevant to what you’re studying. The container for the dig should be large enough to fit the objects that you want to include, but doesn’t have to be enormous. I used a medium sized box from IKEA, but have also used various sizes of Rubbermaid containers and Tupperware. If you have multiple kids sharing a box, you may want to make the box bigger so that they each have their own space to dig in. Also, a box with clear sides will make the dig a LOT easier for your kids to accomplish. They’ll be able to see the layers and perhaps an object or two through the sides. This could be helpful for a younger child! 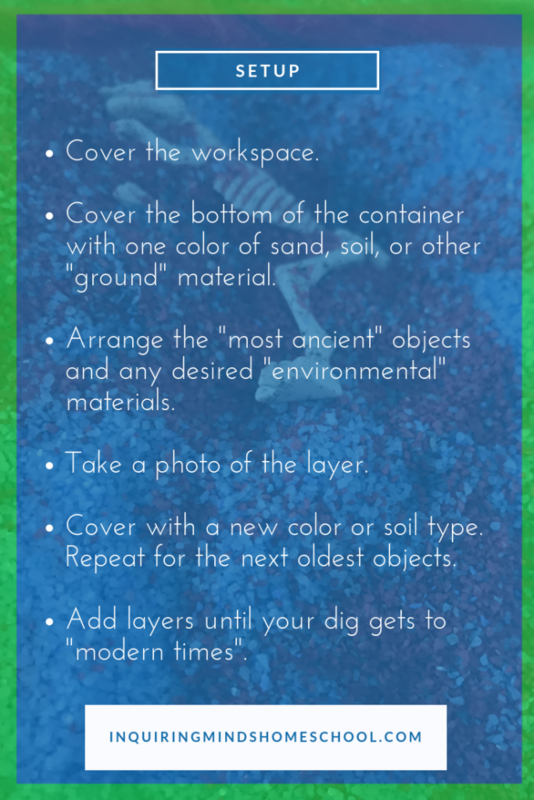 Once you’ve amassed your materials, you can start creating your dig site! I like to work on a covered surface, not near where my kid can see me setting up. I really want him to be surprised at what he finds! Cover the bottom of the container with one color of sand, soil, or other “ground” material. Even air dry clay or mud will work! Arrange the “most ancient” objects and any desired “environmental” materials, like rocks, sticks to represent fallen trees, or pebbles arranged to make a dry riverbed. Take a photo of the layer. This is so that you can remember it when you’ve moved on to the next layer (you might want to continue the “story”) or even show your kids when they’re done digging! Cover with a new color or soil type. Repeat for the next oldest objects. Add layers until your dig gets to “modern times”. You can just cover the dig with a new color/ground type and add a few modern day objects, like pennies or buttons, if you don’t have a lot of intervening layers. In this simulated dig that I put together, the blue layer represents the Mesozoic Era when dinosaurs roamed the Earth. It was then covered by the red layer, which represents the Pleistocene, a more recent time period in which wooly mammoths and other large mammals were around! The next part of the process, once your box is full, is to get it ready for your kids to excavate. If you want to keep things very simple, you can skip making the grid, particularly if you have a small box, a younger age group of child, or both. However, having the grid does make it more accurate! Here’s my son (age 5 in this picture) excavating a box with a grid set up. The 2×2 grid is made by taping string to the sides of the box. The paper underneath the box is labeled in the same way, so that he can take out objects and put them directly on the paper. Now your dig is ready for excavating! Stay tuned for Part 2, which I’ll link here when it’s posted. Got questions? Connect with me on Instagram! 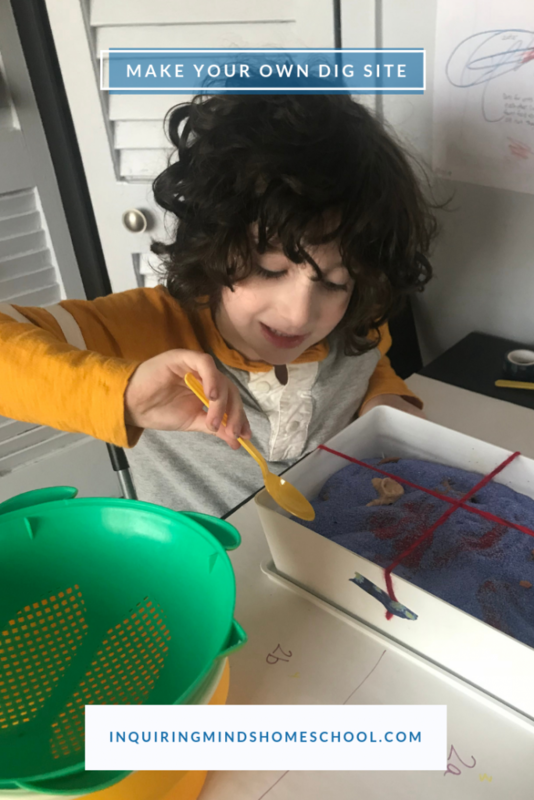 Here’s a recent post about a simulated dig at my son’s request!